So when I got the car I noticed the rear speakers worked, but sounded like total ****. No sound from the front or sub. I'll detail what I'm doing as I try to clean it up but if anyone has suggestions please let me know. My plan at this point is to disconnect everything and start over. Today I finally had some time to open up the front to see what was going on and this is what I found. A jumble of wires, some sort of harness that mates with the factory harness and saw that the stock harness was cut up, but rejoined. Also found 3 sets of RCA's that run to the back of the car. I traced them and found these two small amps. And it looks like the amp is still plugged and 4 wires are tapped. So here's the run down. 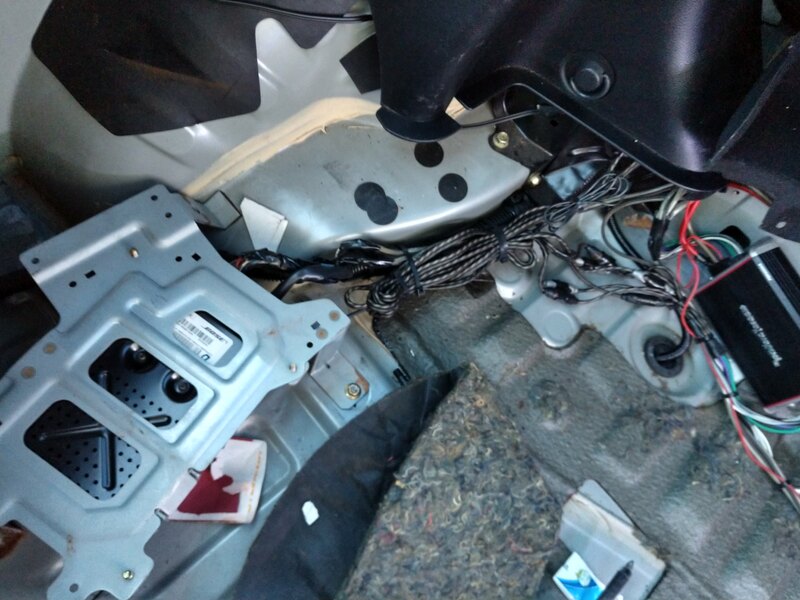 The wires on the HEADUNIT for the REAR SPEAKERS were connected to the cars harness REAR SPEAKERS. I disconnected them, plugged in one pair of the RCA's and it turns out they are for the front. They sound good too. I tried the other set of RCA's and neither of them works. Not sure why I need to further trace the wires and see whats what. It was too cold today to get anything else done. I also noticed that the two factory wires that go to the sub now go from the sub to that other rockford amp. 1. No amp turn on voltage from the HU, you will have to debug that and make sure you have a good 12v turn on lead to both amps in back from the HU. 2. Both amps good? Make sure they are seeign battery voltage and trace the power leads and make sure there is no blown fuse or circuit breaker somewhere between the amps and the battery. Are there any on LEDs on the RF amps to indicate that they are on? 3. HU puttign out good signal? You can plug a new RCA cable from th HU into a boom box or radio and make sure your HU actually works. 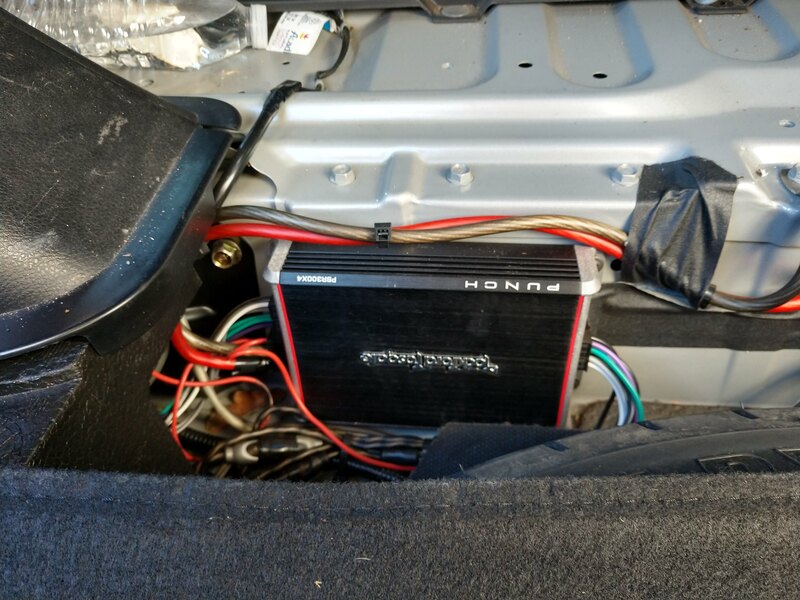 Once you get those amps working, I think you will be fine... its not surprising that the installer left the factory rears hooked up to the Bose amp, they are close to worthless in this car anyways... since they are right behind your head. I keep mine turned down pretty low in my setup and they really don't add anything to the sound quality and if you replace the rear speakers you practically have to gut the entire back of the car to get them in the cabin/trunk divider pillar. My very first thought when I discovered the amps was awesome less work for me... naturally the first thing I did was to check for power so I went back and checked the battery and sure enough there was an 8 gauge cable running to from the battery to both amps, Verified they were grounded and the amps both have a blue power indicator that is on. So we know they are getting power. Out of the 3, only one pair provides sound and thats sound to the front speakers. BUT whats interesting is that was the only pair of RCA's connected to the Head Unit, then they had ONLY the rear speakers connected using the head unit HARNESS. SO when those are connected the fronts stop working... Disconnect the rears and the fronts work again. 1 - Leave the fronts as is, they sound good. When I open the door to adjust the window regulator I will see whats installed and either upgrade or leave as-is. 2 - Remove the sub, widen the opening and stick a small sub box in there and wire it to the existing amp. 3 - Ignore the rear speakers and leave them disconnected. 4 - Remove all excess wiring and left over BOSE stuff and have a drink because the nightmare is over. 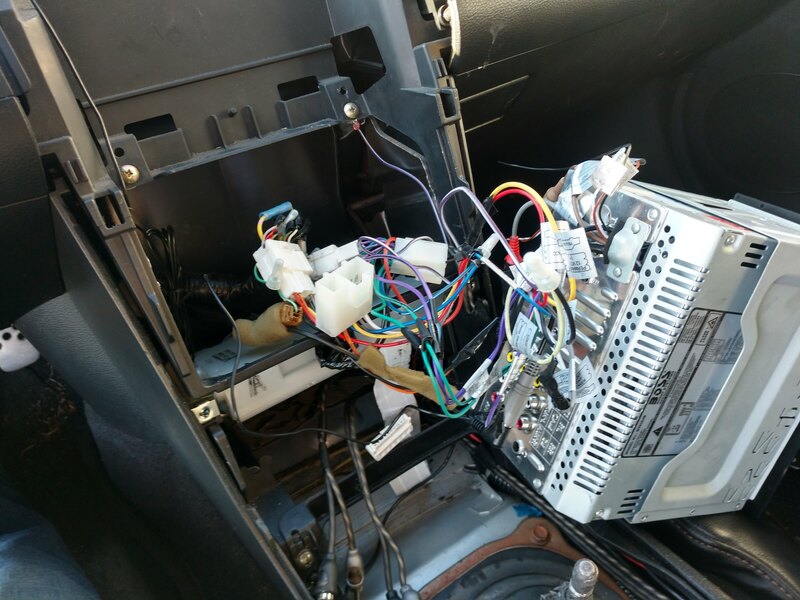 You might want to check the specs on the head unit too.... maybe if you connect the rear speakers, it assumes you are using the HU to power everything. Or maybe there is an option to turn on/off the RCA outputs. I have no experience with Boss Audio components, at all. I think Pioneer HUs allow you to use internal amps from the HU while still keping the RCA outputs active. I would focus on being able to use the RF amps, as those are going to sound way better than the Boss HUs amp. Leave the rears disconnected or unplug the rear speaker amp, I think its under the front drivers seat... that way you can focus on gettign the right signals to the front speakers and sub, and not have the rears messign with things while you are debugging. 1. Disconnect the factory amp, Bose. This is done in 2 steps, you need to cut the power to it (from the head unit); disconnect the speaker cables to it. 2. 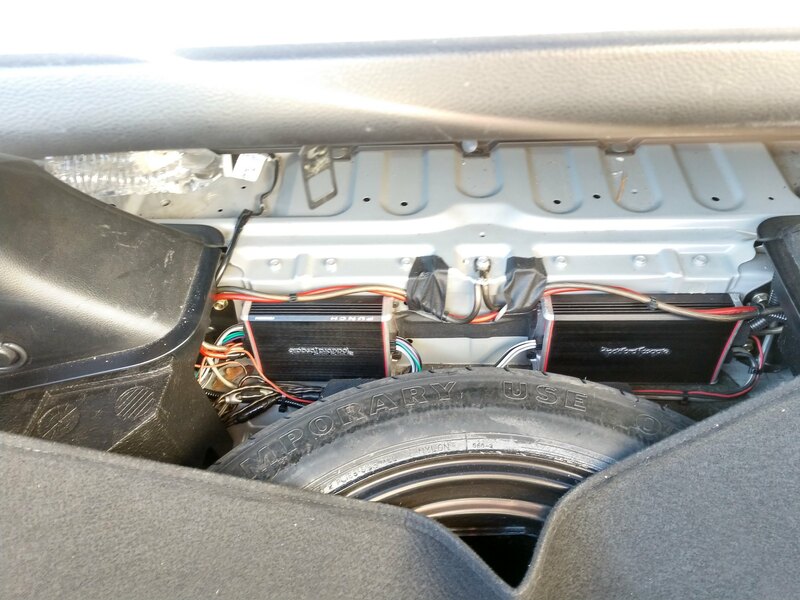 Replace the speakers to 4 ohms versions. The subwoofer is the most important, it's a low ohm unit and won't work ok with the RF amp. 3. Run speaker cables from the RFs to the speakers, don't use the factory wiring, just leave it there. This way you can be sure the stereo, amps, everything will work fine. It's like installing a new system from zero; only that you already have the amps. how well does your V1 setup work? what would be your perfect custom setup?